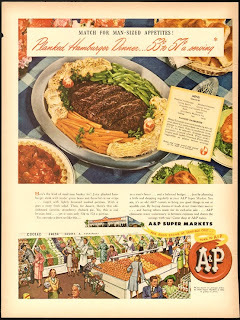 1947 A&P Ad... Is that guy in the center smoking? I have to continue on my theme of A&P from yesterday because in my research I discovered some things about the company I didn't know before and well... it's a sad tale of how the depression gripping our nation right now is bringing companies to their knees. A&P stands for The Great Atlantic & Pacific Tea Company which was founded in 1859. The first stores opened up in 1912 by 1930 they were at their height with over 16,000 stores nationwide. By 1947, when this Ad appeared, the company was already in a a slow decline and by 1955 only operated 10,000 stores. Throughout the late 20th century, the company slowly pulled out of certain states and in others revamped their operations under different names. In Maryland where I am from the revamped A&P became SuperFresh and while I knew of these stores when I lived their I didn't shop at them very often. The original A&P name was only retained on stores in the New York Metropolitan area. By 2011 the company threw in the towel due to deteriorating sales. The last 338 stores are slated to close before the end of the year while the company declares Chapter 13 Bankruptcy. It is indeed a sad end to a great name in the grocer business. A&P innovated such things as discount pricing and weekly sales and it was said that they were Wal-Mart before Wal-Mart existed. It's a shame we have to lose them because the customer service you got at their stores could never be copied or exceeded by a corporate behemoth like Wal-Mart. Fascinating! I shopped at A&P while growing up. We had a store in our town. The customer service was wonderful. I am sorry to read they are closing for good. You have a very interesting site and great photos. :) Thank you for your visit.